Chris Graham took this picture a week ago of the Alapaha River at US 84, where tomorrow’s WWALS Outing will end up. 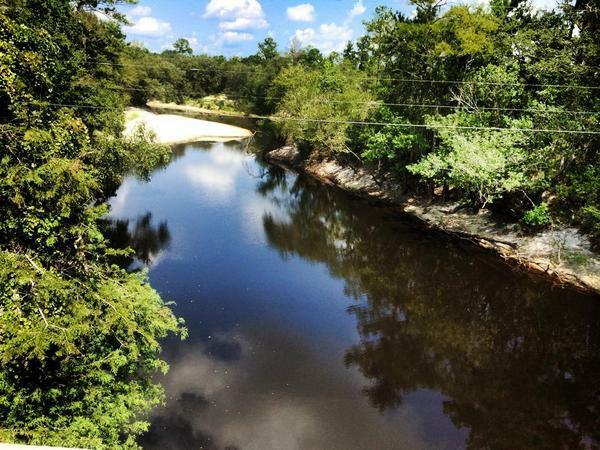 Come join us on this gem of a blackwater rural river! We’re boating the central area of the in-progress Alapaha River Trail, tomorrow afternoon, Sunday, August 24st 2014. Meet up at 1:30 at Hotchkiss Crossing on the Lanier County side. We will drop the boats off, drive the end point at US 84, on a public right of way, where the road is gravel. Get on water at 2:00. We will pass by the location for the new Lowndes County boat ramp and public access point. This is a relatively short paddle, about 1.27 miles, but it could take as long as 2 hours if the water level stays low. You don’t have to be a member to come. Join us and see how you like our blackwater rivers, and then consider joining. Or go ahead and sign up as a member. You can also let us know you’re coming by joining the facebook event. If you don’t have a boat, let us know in advance, and we’ll see about arranging one. For more river pictures and directions, see the previous blog post. This entry was posted in Aquifer, Blueway, creeks, Maps, Outing, River and tagged Alapaha River Trail, Aquifer, Blueway, conservation, creeks, Georgia, John S. Quarterman, Lowndes County, Maps, north Florida, Outing, river, south Georgia, watershed, WWALS, WWALS Watershed Coalition on August 23, 2014 by jsq.